In my wildest dreams I would never have imagined myself as part of a massive crowd of people, rising before dawn and sitting for days on end avidly listening to one man’s words, and yet I was, last month, in India! I’d committed to receiving the Kalachakra teachings and initiations from His Holiness the Dalai Lama in Bodh Gaya, place of the Buddha Shakyamuni’s enlightenment. Only six months previously I had given away an opportunity to receive the same initiations when the Dalai Lama was conferring them in Washington D.C., because I had got stuck in my own ignorance, fear, and drama. 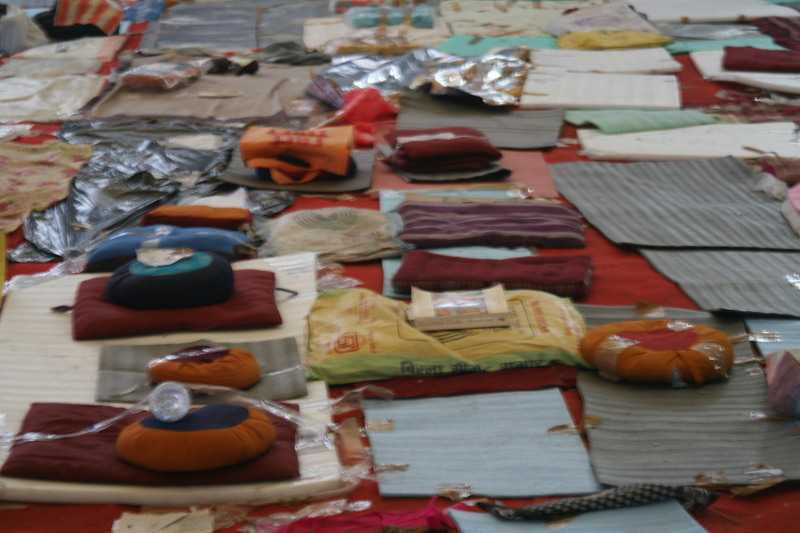 Taking bodhisattva and refuge vows were at the bottom of my reluctance to attend. I was fearful of what that might mean for me, hung up on words that freaked me out, understanding them in a narrow sense, intellectually, coloring them with my own phobias around lineages, commitments, and interconnection. I can often feel major change coming and sometimes hold back from engaging, but the importance of change has rarely been outlined so clearly for me as it was over my decision, only a week or so before it started, not to go to the D.C. gathering. The resultant mystifyingly intense feelings of loss and grief and my subsequent promise and prayer, that if I ever received the opportunity to attend again I would take it, were the reasons that I found myself in India. The months preceding my departure proved to be a rich time of letting go, as the penny viscerally dropped around what it really means to be compassionately linked to every living being. The call to travel to India had come early in August. 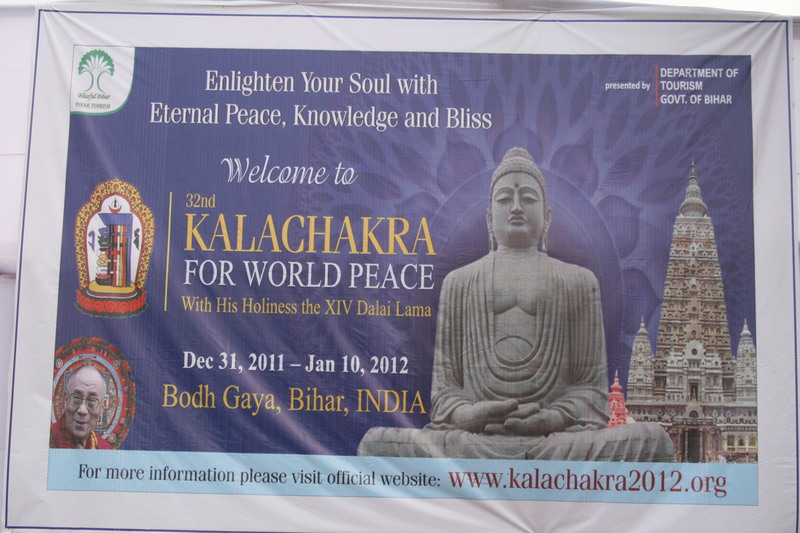 I was contacted by a friend informing me that there was a cancellation in a group going to the Kalachakra to be held in Bodh Gaya in January. ‘You need to make up your mind fast if you want to go’, she said. I didn’t hesitate. By the end of the next day I was booked, and just as immediately my sub-conscious preparations started. 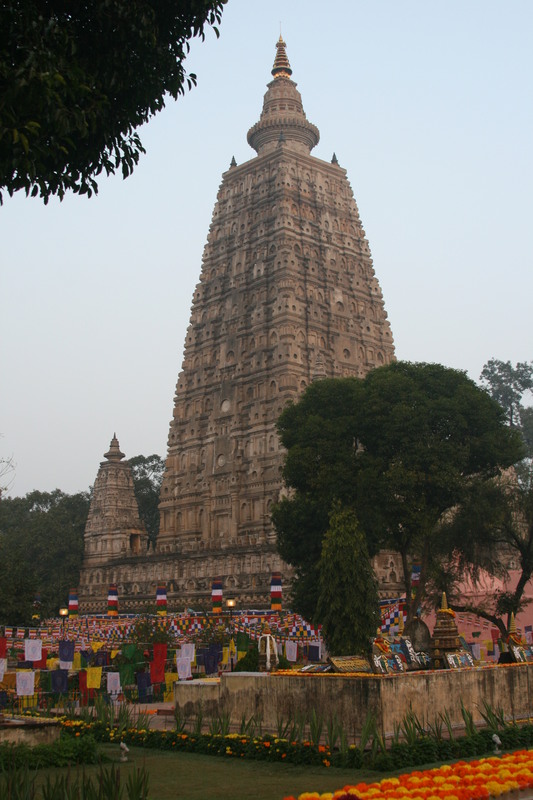 Bodh Gaya, a predominantly Hindu town, was teeming with people from that very first day of the Kalachakra all going to and from the teaching arena on foot, by tuk-tuk or in a rickshaw. They presaged the long entry lines for foreigners and another for Tibetans, monks and nuns which started well before the security gates. We’d come in droves from far and wide to receive these important teachings. Once through security we all headed for a vast expanse of cobbled together plastic sheeting which formed one large covered area under which we were to sit for the next ten days. More covering than tent, it was divided by bamboo railings into sections that felt like sheep pens to me. Makeshift signs suggested that we sat in specific areas for, for instance, ‘Monks’, ‘Nuns’, ‘Koreans’, ‘Foreigners’. It didn’t always happen but it helped to create some order. Once planted everyone tried to keep their place for the entire teaching. It wasn’t always easy! If you left your cushion and your precious roughly 24”squ. space unattended it was likely to be swallowed up. If you weren’t there well before prayers started each day it was gone. 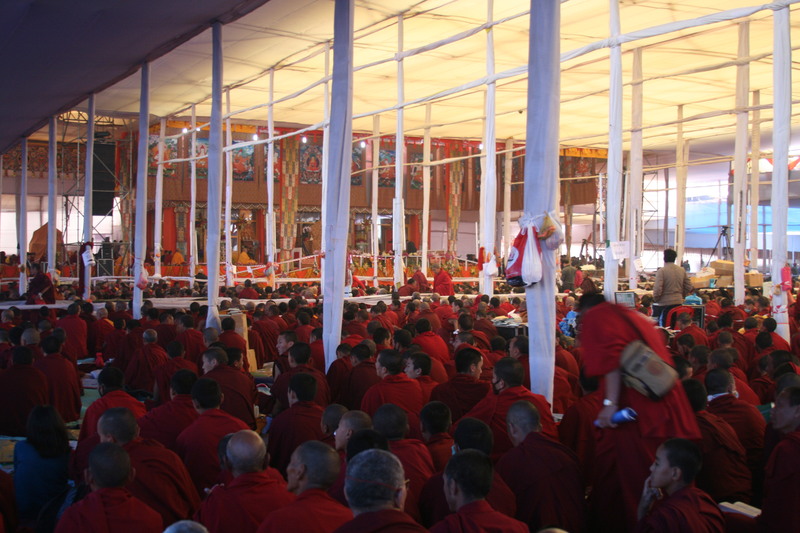 And to intensify the journey, more people arrived as we went from the preliminary preparation stage to the teachings and then finally to the initiations. A pen that felt like a crush on the first day contained almost double the people by the last! 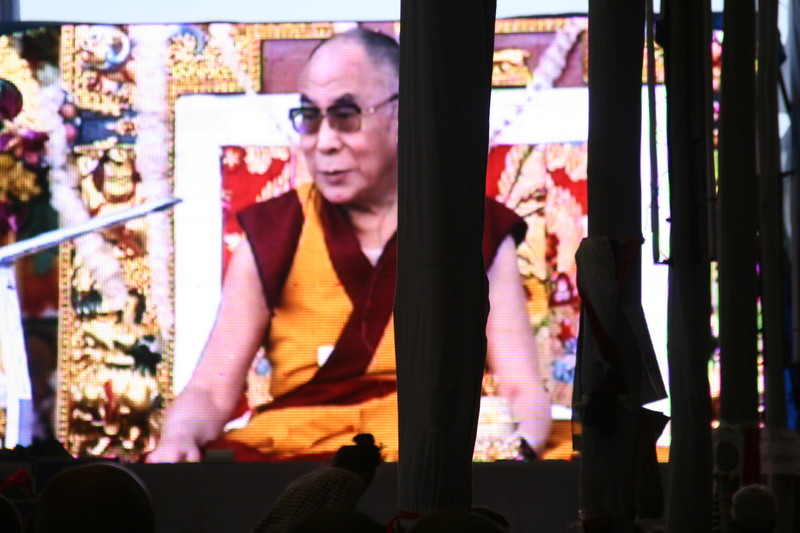 To sit in the vibration and sonorous beauty of the monk’s chanting as the Dalai Lama laid the energetic framework on which these teachings rest was an incredible experience. The rhythm of the sound, and the movement of His Holiness’ hands weaving an energetic structure in sacred mudras was translated slowly into the physical by a few of the monks who completed a sand Mandala ‘palace’ for Kalachakra while his Holiness offered us the teachings. Just before the initiations we were invited to view it over consecutive evenings, and to receive its blessing. 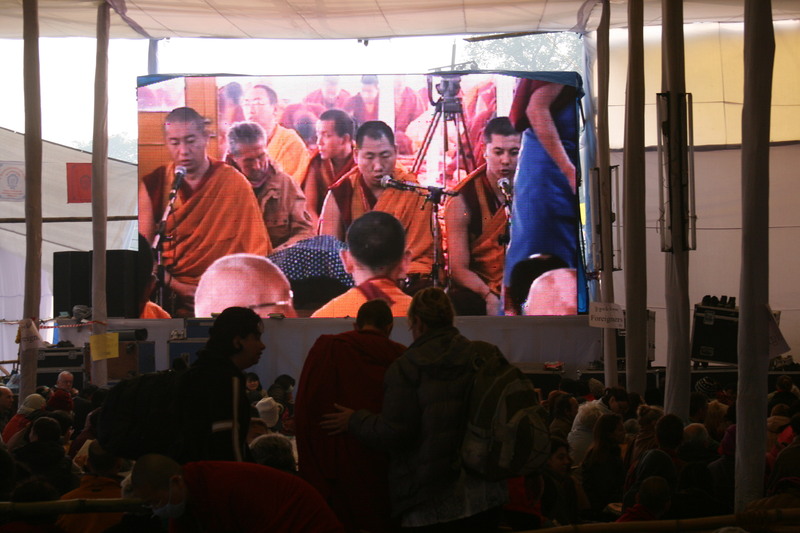 The ferocious passion with which the Tibetan people entered into this as well as every other aspect of this ritual was amazing – they were impatient to personally see the completed Mandala; they stormed the security gates when the lines were preventing them from being present at the start of any given day; and they were overjoyed to see the Dalai Lama. They are refreshingly open in the expression of their devotion. The reality of life’s dual nature was everywhere. Although we were there to participate in a very spiritual practice some of the requirements and behaviors were anything but spiritual! There was the lavatory initiation! There seemed to be only around half a dozen western style Portaloos to service the vast crowd attending, and about the same amount of Asian-style loos, both with a real risk of long lines and a guarantee of a hideous experience. And samsara was ever present ….I saw a woman who arrived a little late one morning hit another over the head with a radio arial, pushing her because she wanted her to move over and vacate ‘her’ space! And she wasn’t alone, every morning there was squabbling around the foreigner’s pens as many more arrived and the increasingly tired inhabitants came to terms with their progressively limited space. 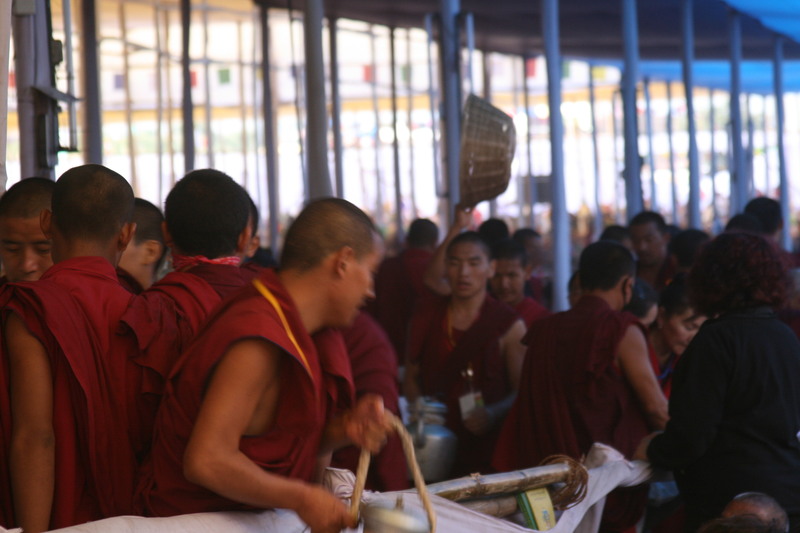 In contrast, once seated, the monks and nuns never fidgeted, quietly waiting for the prayers or teachings even as we ‘foreigners’ swooped on the free offerings of bread and butter-milk tea brought round each day, and jumped up to collect free handouts of biscuits and books distributed to all by the monks. Sometimes we momentarily forgot the needs and wants of those around us, self-interest overtaking us and highlighting the need for these teachings to be seeded and take root. All the glorious expressions and dramas of humanity were constantly there, shining brightly on each of our shortcomings, and personally astonishing, teaching, and humbling me. Each day from the start of the preliminary teachings to the completion of the initiation, I ended my day of learning at the Mahabodhi Temple just a short walk away. Circling the sacred Bodhi tree with hundreds of others, and mantra’ing my gratitude or emptying my mind, I felt golden streams of pure creation vibrate through and saturate everything in and around me. Each day in these energies the gifts of the teachings sunk more deeply into my being. As the teachings started I felt the seed of compassion for all beings being planted in me so that compassion lives within me in a completely new way, one that isn’t event driven or personal, but that appreciates the root of what it means to be human in all its many forms and faces. The initiations themselves were precise, almost business-like in their execution, one vow following another, and yet for me taking them was deeply emotional. It’s an acknowledgement of and commitment to my own path of evolution, but with the sworn intention to bringing the grace of awareness and transformation to others for theirs. To do this in such a potent place felt miraculous. 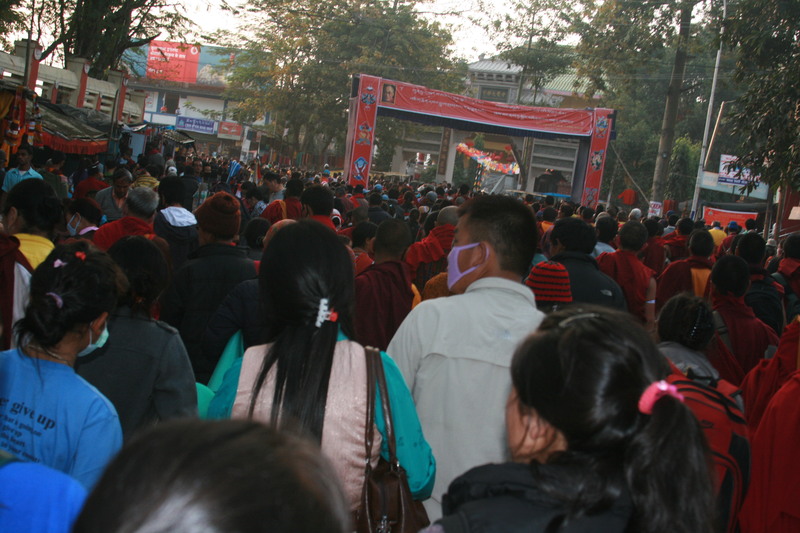 Like many of the estimated 300,000+ pilgrims who lived and prayed in Bodh Gaya for those two weeks I am counting my blessings, one of which was, bizarrely, a horrendous chest infection. It caused me to go slowly and integrate my experiences gently over several weeks. This initiation has changed me, and I live in gratitude for the opportunity that I was given to attend, and for the wisdom of my teachers, in this world and all others. ‘In the various Bodhisattva vows the Bodisattvas take a vow stating that they will strive to liberate all sentient beings from samsara and lead them to enlightenment. The Bodhisattva does not seek bodhi (Awakening) solely for him/herself, but chiefly for the sake of freeing all other beings and aiding them into the bliss of Nirvana. ‘Driven only by fear, do men go for refuge to many places — to hills, woods, groves, trees and shrines.